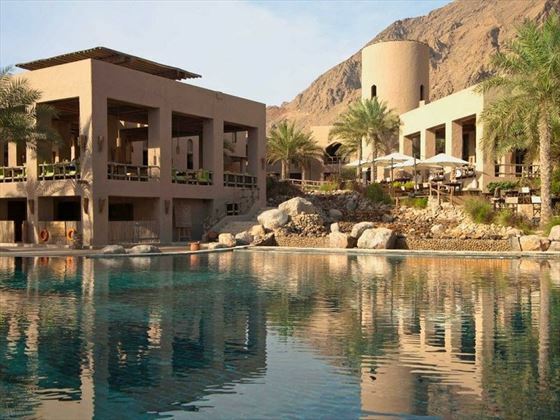 Settled amongst the rugged mountains of Oman’s Musandam Peninsula, Six Senses Zighy Bay is a beautiful hotel with spectacular views of the mountains on one side, and the sugary sands of Zighy Bay on the other. 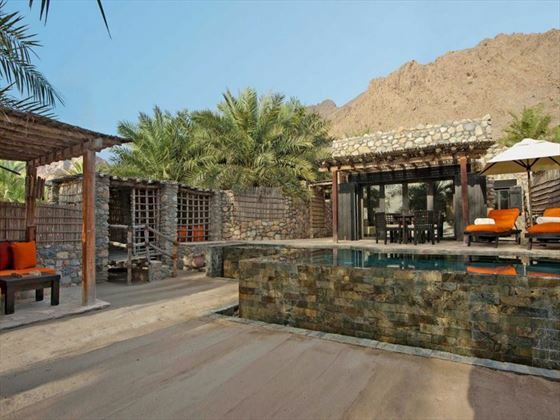 With its own marina, two fabulous swimming pools and an award-winning spa, Six Senses Zighy Bay will easily make you feel pampered and relaxed, and that’s before you’ve even seen the villas. All of the properties are built with natural stone and woods, creating a rustic luxury feel, and feature their own private pool and Guest Experience Maker (GEM) or butler service. The beachfront villas are the most lavish, with the pristine beach just steps away from your private pool. Six Senses Zighy Bay prides itself on its unique dining experiences. 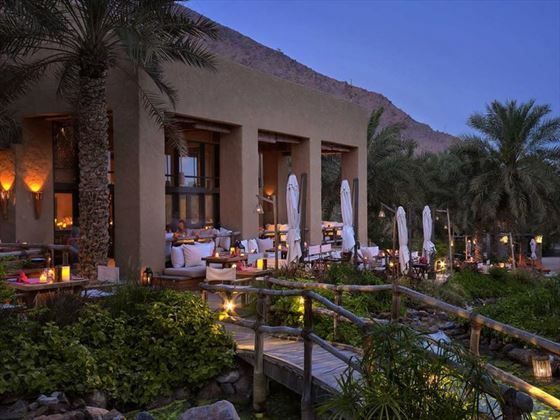 Dine on decadent three, five, seven or nine-course set menus under the stars atop a scenic mountain at Sense On the Edge, or treat the family to a traditional Bedouin experience at Shua Shack. The Six Senses Spa and indulgent pools are perfect for couples hoping to unwind together. 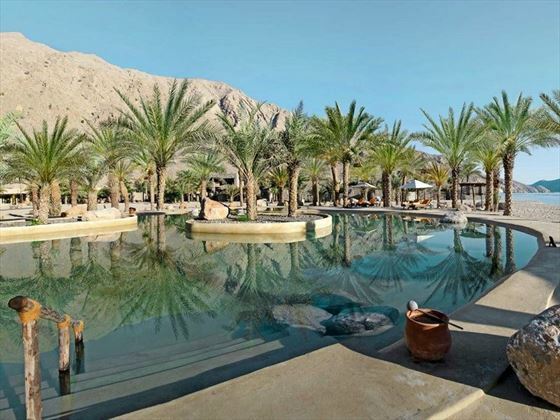 There’s plenty here that makes the hotel a fabulous choice for families too – the Chaica’s (kid’s) club and Al Feetean’s (teen’s) club offer a variety of fun hands-on activities, including treasure hunts and Hajar rock painting for the kids, and moonlight kayaking, adventure hikes and raft building for the teens. 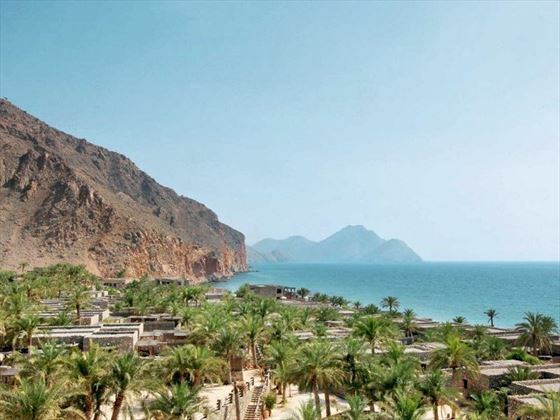 The hotel is nestled in the north of Oman’s Musandam Peninsula, which is adorned with soaring mountains, jagged coastlines, and turquoise waters home to dolphins and other beautiful sea creatures. 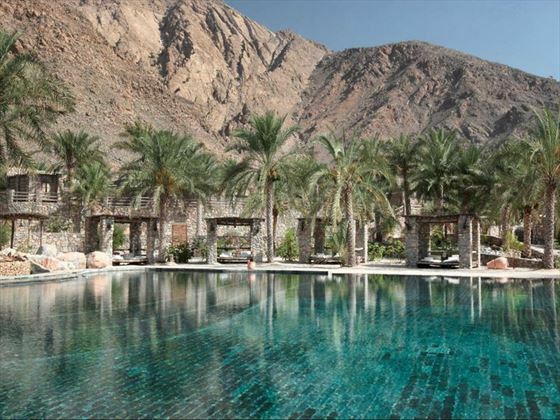 A scenic 120-minute drive from Dubai, this is a naturally beautiful, hidden gem. Pool Villa – A gorgeous 247sqm villas built with natural stone and warm woods. Featuring a cushioned living area, a private outdoor dining and lounging area, and a private pool. Located on the second and third rows from the beach. Spa Pool Villa – Similar to before, these charming 247sqm villas are created with natural materials and are located on the second row from the beach. 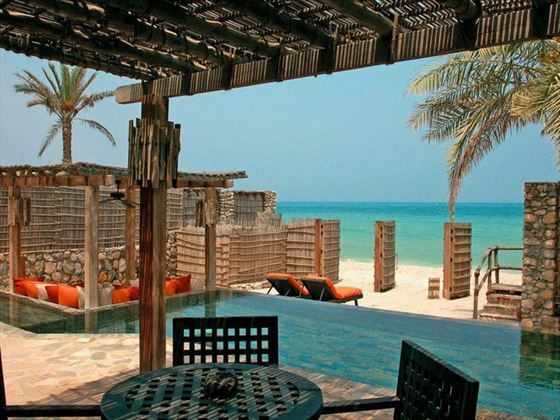 These villas have the added pleasure of a personal in-villa spa for Six Senses Spa treatments. Pool Villa Beachfront – Beautiful 880sqm villas featuring the standard amenities, plus direct access to the beach just steps away. 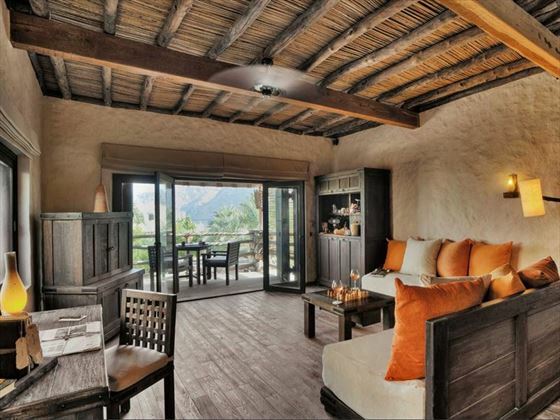 Spa Pool Villa Beachfront – These rustic yet luxurious 880sqm villas feature a lovely personal in-villa spa for Six Senses Spa treatments, and outdoor shower. They are also only a few steps away from the sugary sands. Pool Villa Suite – Spacious and airy, these 412sqm villa suites feature a separate living room with a full bathroom, plus the standard amenities. Nestled on the third row from the beach. Spa Pool Villa Suite – Similar to before, with the addition of a personal in-villa spa with Six Senses Spa treatments, and two outdoor showers. Pool Villa Suite Beachfront – These 1,360sqm villa suites are the most spectacular, with the same amenities as the Pool Villa Suites, but with plenty more space and only a few steps from the pristine beach. Summer House – A charming eatery open for lunch or an afternoon bite and dinner, including delicious homemade ice creams and sorbets. 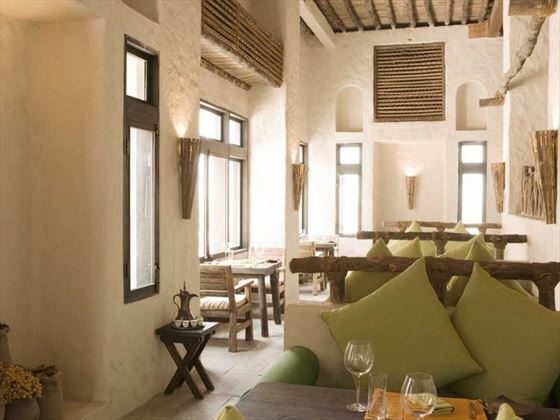 Spice Market – This fabulous place is the hotel’s main restaurant, serving delicacies enjoyed all over Arabia. The food is even cooked in a traditional mud kitchen. Zighy Bar – A trendy bar serving classic and organic mocktails and cocktails throughout the day and evening. 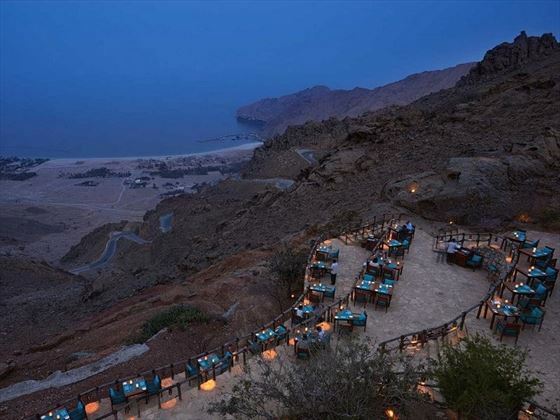 Overlooking Wadi, be sure to come during the ‘No Rush’ hour from 9pm-midnight. Sense on the Edge – This is ideal for a one-of-a-kind dining experience. Nestled on a mountaintop, you have a choice of either a three, five, seven or nine-course set menu paired with a variety of decadent wines as you take in the views and relax under the stars. Open for dinner Wednesday-Sunday. Reservations required, and there is a smart casual dress code. Shua Shack – A traditional Bedouin dining experience perfect for families. The evening starts with a local organic salad, followed by sumptuous lamb prepared in an underground oven. Open Mondays and Fridays from 6.30pm, reservations required. The Shua Shack will reopen on October 1 2017. Wine Cellar – Sitting two to eight people, this is a wonderful location for an intimate dinner or a fabulous pairing evening. The cellar is filled with some of the world’s most diverse wines, and the master sommelier hosts regular tastings. The hotel is nestled on a powdery white beach, and has its own marina. Six Senses Spa Zighy Bay – Escape from the worries of everyday life at this soothing, tranquil spa that offers a retreat for the mind and body. The spa uses ancient holistic treatments for added luxury, whilst the Six Senses Integrated Wellness program will grace you with lifestyle and nutritional advice, plus fitness and wellness activities to help rejuvenate your mind, body and soul. 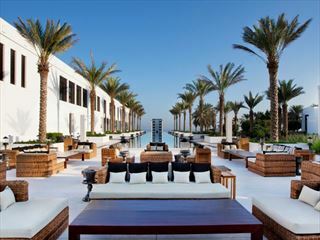 Treatments include sensational massages, Arabian facials, and a Moroccan hammam. The Chiaca’s Club for children aged 4-10 years old offers a plethora of fun activities to keep them entertained. Activities include Hajar rock painting, salt dough art, treasure hunts, swim relays, water polo, Zighy Cinema screenings, scavenger hunts, Arabic lessons, beach bowling, pizza making, and feeding the Zighy goats. The Al Feetean’s Teen Club offers plenty of fantastic activities for teens aged 11-18 years, including raft building, abseiling, canyoning, adventure hikes, photography classes, jungle gym, and moonlight kayaking. • The Main kitchen, which serves both Spice Market and Summer House, will be refurbished in phases over 3 months and will be back in full swing on September 1, 2019. • The Spice Market open kitchen will also be expanded into a full live kitchen for guests to experience the flavors of Arabia come alive every night. • In the first phase, the main and Spice Market kitchens will undergo renovation. During this period, Spice Market will remain closed and breakfast and dinner will be served at Summer House. • In the second phase, the Summer House kitchen will undergo renovation. Summer House will remain closed for this period and Spice Market will once again serve breakfast and dinner. • During the daytime, all the outlets at the heart of the house - Spice Market, Summer House and Zighy Bar - will be closed to ensure guests are not disturbed. 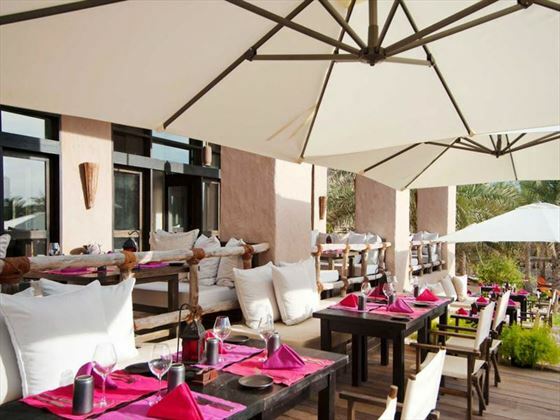 • Sense on the Edge will open for lunch every afternoon and will offer an international a la carte menu. This will be a first as this amazing venue is usually open for dinner only. 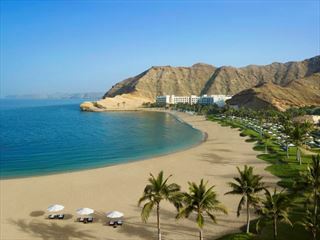 The new menu offers guests another dining option over these months as well as a spectacular view of Zighy Bay. In the evening the restaurant will continue to offer its signature cuisine. • Villa 1, The Private Reserve, will serve as an alternative to Mezzaria. We want ensure guests have access to a beachside lunch service as well as a stretch of pristine beach nestled against the mountainside. • Going into the winter, the kitchen will be able to offer fresh and exciting menus and new dishes thanks to the upgrades. Our chefs are very excited for another opportunity to wow. 2. The Chaica’s kids club will be moved to near the Al Feetean’s teens club to create more fun for children and added ease for parents. 3. The saltwater pool will stay closed from June 10, 2019 until August 10, 2019. 4. The main beach will also be replenished in two phases. • During June 10 – August 10, 2019 the length of the beach south of the main beach bar, from villas 22 to 36, will have its sand replenished. • During August 10 – September 10, 2019 the length of the beach north of the main beach bar, from villas 21 to 1, will have its sand replenished. • During this time – vehicles and some machinery will be on the beach supporting this work. • Once replenished the beach will offer even more seamless access to the ocean from anywhere in the resort. • One Retreat (villa 36) will be out of sale for refurbishment from June 10, 2019 to August 10, 2019. • The other Retreat and the Reserve will be out of sale for refurbishment from August 30, 2019 to October 15, 2019.